A recent clinical study entitled “Evaluation of Endoscopic Vein Extraction on Structural and Functional Viability of Saphenous Vein Endothelium” was published in the Journal of Cardiothoracic Surgery on June 10, 2011. Dr. Hemant S. Thatte; Associate Professor of Cardiothoracic Surgery Harvard Medical School and Brigham and Women's Hospital; and Director, Cardiac Surgery Research at the VA Boston Healthcare System was the principal scientific investigator of this study. The study was designed to isolate vein harvesting performance from the coronary artery bypass grafting procedure and any other confounding factors. Previous studies have shown that endoscopic vein harvesting causes structural and functional damage to the saphenous vein endothelium. The study evaluated the effect of the VirtuoSaph® Endoscopic Vein Harvesting System on the structural and functional viability of saphenous vein endothelium using multiphoton imaging, biochemical and immunofluorescence assays. Nineteen coronary artery bypass graft (CABG) surgery patients were prospectively identified. The VirtuoSaph® Endoscopic Vein Harvesting (VsEVH) System was utilized for one portion of the harvesting procedure and the “no-touch” open saphenous vein harvesting (OSVH) technique was utilized for the other portion. Use of the VirtuoSaph® System did not reveal any structural and functional cellular damage on the saphenous vein. 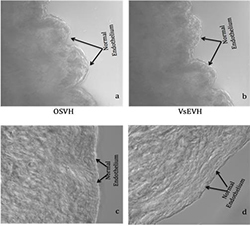 Morphological structure, esterase activity and endothelial viability were well maintained in the VsEVH samples, and were similar to those observed in the corresponding samples harvested by the OSVH technique. Dr. Thatte wrote that “Morphological, biochemical and immunofluorescence parameters of viability, structure and function were well preserved in VsEVH group as in OSVH group”. Further comparative study is required to examine graft patency rates at one year post operatively. Dr. Thatte and his team are currently studying the possible negative effects of CO2 on vein structure and function. To download a PDF of the complete study by Dr. Thatte, click here.